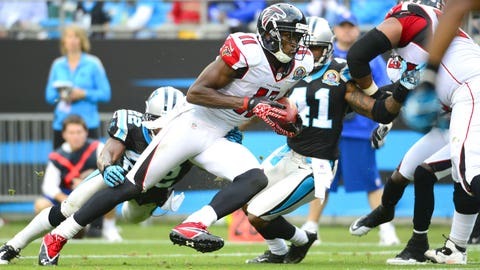 In the Thomas Dimitroff era, the Falcons have moved up in the draft seven times (source: 680 The Fan in Atlanta) -- highlighted by the major acquisition of wide receiver Julio Jones in 2011 (Round 1). The Atlanta Falcons desperately need to have a good draft. If having their coaching staff work the Senior Bowl helps to turn around last season’s 4-12 record, the Falcons might have a leg up when May and the NFL Draft rolls around. "Talking with coaches that I consider mentors that have coached in this ballgame, they have said that they had some of their best drafts after spending the week with the rising seniors that are draft eligible," said Falcons head coach Mike Smith, according to a transcript provided by the bowl. Just in terms of probability, a team might select at most two or three players who participate in the bowl, but having that inside look at players can do nothing but aid the evaluation process. The Falcons’ record in the second and third rounds has been somewhat spotty the past few years — linebacker Akeem Dent in 2011 (3rd round), offensive lineman Peter Konz in 2012 (2nd round), offensive tackle Lamar Holmes in 2012 (3rd round) — so, a little help can never hurt. The question Smith was asked was in reference to whether it’s a good idea or not for a staff not falling too in love with a player. For his answer to be the contrary, it indicates that the Falcons indeed could benefit. Atlanta’s greatest needs fall on the offensive and defensive lines. In the past, Dimitroff has shown he’s not afraid to pick multiple players from the same position group in the same draft. Last year, he took cornerbacks (Desmond Trufant and Robert Alford) in each of the first two rounds. The year before, he selected offensive linemen (Konz and Holmes) with each of Atlanta’s first two picks. The Falcons’ Senior Bowl traveling party (Mobile, Ala.) includes: Smith, general manager Thomas Dimitroff, new assistant general manager Scott Pioli and the rest of the scouting staff. Smith was asked about the offensive linemen at the game. Two of the players in whom the Falcons might have interest in selecting with the No. 6 overall pick are not participating in the Senior Bowl. One is Texas A&M left tackle Jake Matthews and another is Auburn left tackle Greg Robinson, who is an underclassmen and not eligible for the game. Matthews was one of nine players who was invited to compete but elected not to even though he is not injured. In answering what he thought about players who are invited to play in the game but choose not to compete, Smith gave a partial answer. It’s unlikely that if the Falcons deem a player good enough they’d hold it against him for not competing in the game. "There are a number of reasons why I’m sure guys donât participate," he said. "They go through a long college season — some of them may have nicks. I know there were a number of guys who were not healthy enough to participate in the ball game. "Each person must make their own decision. Me, myself, personally, I believe when you get an opportunity to go out and compete and show what you’re capable of doing, you should take advantage of every opportunity." Nonetheless, it’s impossible to know if the Falcons might end up using their early second-round pick on a player that they scout at the game. "We’ve been here 48 hours and I’ve gotten more information in those 48 hours than when I’ve spent three or four days from the squad," Smith said after practice on Tuesday. "It is invaluable to have the opportunity to coach this game. Our coaching staff has embraced it. We get an opportunity to interact with both teams. We have a common cafeteria so weâre getting an opportunity that 30 other teams do not get and that’s to interact with these players in different settings. "The media setting, watching tape, practice, riding the bus; you get a lot of information when you spend a lot of time together." While the opportunity might be invaluable, only time will tell if the Falcons will end up drafting a player from this game who ends up being valuable to them on the field.